Did you know that there were 441 deaths due to asthma in 2017? It still happens. Would you know what to do in an emergency? 1 in 9 Australians have asthma – around 2.7 million people. There were almost 40,000 hospitalisations in 2014-15 where asthma was the main diagnosis. Children under 15 are more likely to be hospitalised with asthma. It’s more common in males under 15, but more common for females over 15. The rate of asthma among Indigenous Australians is almost twice as high as that of non-Indigenous Australians. Only 57% of children (under 15) have an asthma action plan. Causes of Asthma? People with asthma often have: a family history of asthma; eczema; hay fever; exposure to tobacco smoke (especially as a baby or young child); and obesity. What are the symptoms of asthma? A person’s asthma symptoms can vary over time – sometimes they will have no symptoms, especially when their asthma is well-controlled. Symptoms often vary from person to person, but they are most commonly: breathlessness; wheezing; tight feeling in the chest; a persistent cough. The symptoms often occur at night, early in the morning or during/just after activity. They are caused by the narrowing of the airways. Diagnosis and management of asthma for children under 12 months is not recommended within the primary care setting. If your infant is wheezing, your doctor should seek advice from or refer you to a paediatrician or paediatric respiratory specialist. The recommendations are different for children aged 1-5 years compared to 6 years and over. Please check with your GP that your child’s care is consistent with the new guidelines. If your child has allergic rhinitis (hay fever), ask for allergen management advice. Discuss allergen immunotherapy as a strategy for asthma prevention. See your GP before your child returns to school each year. Back to school asthma is a known and serious risk and is firmly set out in the updated guidelines. You may find this website is helpful to educate your youngsters about their respiratory disease. 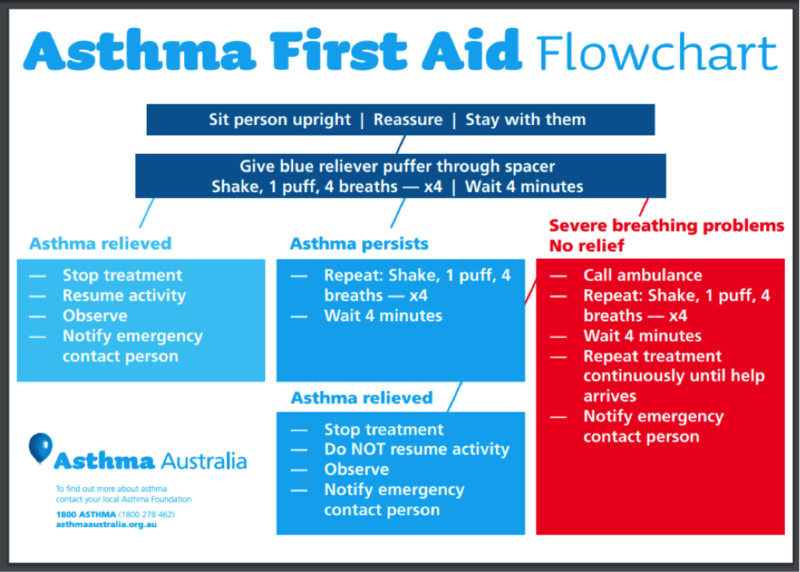 Please see the updated flow chart (at the top of this post) for Asthma First Aid. This short video demonstrates how to treat a mild asthma attack. In a more acute attack the process is the same, but it is extended for a longer period. It may be necessary to continue the first aid treatment until the Ambulance arrives. Asthma Australia have also released a great app to assist with the management and treatment of Asthma. It is free and it is only available on iOS devices so far. Download it here. This entry was posted in News, Parents. Bookmark the permalink.